Budhanilkanhtha Sundarijal Hiking includes includes the pilgrimage site- Budhanilkantha temple, Shivapuri Natioanal Park’s Conservation Areas, villages, Nagi Gompa en route and Tarebhir (the cliff famous for Rock climbing). The route is perfect for Bird Watching and viewing Kathmandu surrounded by four major hills. The hiking distance is 18 km and takes 5 – 6 hours. This is the route blended with natural vegetation, wild animals like deer, leopard, wild cat etc. and the place for many varieties of butterflies and birds. Apart from this it has cultural fragrance. All these things combines with the majestic mountain views that can be seen from here. The journey of Budhanilkantha Sundarijal Hiking begins with a wonderful drive from Kathmandu to Budhanilkantha, then we will hike to Sundarijal then drive back to Kathmandu. After breakfast, we drive from hotel to Budhanilkantha temple, 8 km north, takes about 30 minutes by car. It is the sleeping Vishnu, the great stone image from Lichhavi period. After 20 minutes’ walk, we reach to the entrance of Shivapuri National Park where there is a military camp. We take the entry permit and register our name then start walking inside the forest. After half an hour’s walk we reach to Nagi Gumba. The view from the top is eye catching in the clear day. We continue hiking passing the cliff named Tarebhir, famous for rock climbing. The hiking distance is 18 km and it takes about 5 to 6 hours to reach to Sundarijal. This is the perfect day hiking going through villages, National Park, forest, monastery etc. We will carry the packed lunch and before we get down to Sundarijal, we can have lunch and walk to our destination. 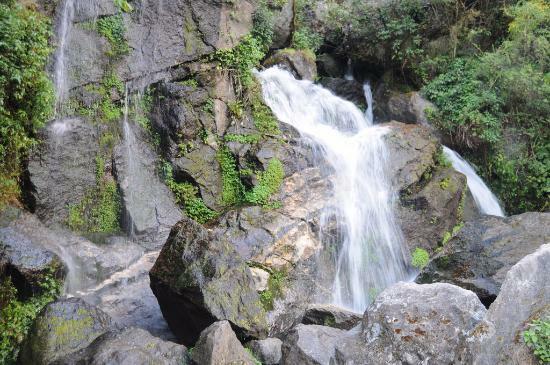 We can view hydro power project, water pipe, waterfall and big boulders there. Finally, we drive back to Kathmandu from Sundarijal. We assure you best hospitality and quality services. So, lets start your next adventure with us. The journey of Budhanilkanhtha Sundarijal Hiking begins with a wonderful drive from Kathmandu to Budhanilkantha, then we will hike to Sundarijal then drive back to Kathmandu. After breakfast, we drive from hotel to Budhanilkantha temple, 8 km north, takes about 30 minutes by car. It is the sleeping Vishnu, the great stone image from Lichhavi period. We start our hiking after walking around and observing ritual activities performing inside the temple premises. After 20 minutes' walk, we reach to the entrance of Shivapuri National Park where there is a military camp. We take the entry permit and register our name then start walking inside the forest. After half an hour's walk we reach to Nagi Gumba. The view from the top is eye catching in the clear day. We continue hiking passing the cliff named Tarebhir, famous for rock climbing. The hiking distance is 18 km and it takes about 5 to 6 hours to reach to Sundarijal. This is the perfect day hiking going through villages, National Park, forest, monastery etc. We will carry the packed lunch and before we get down to Sundarijal, we can have lunch and walk to our destination. We can view hydro power project, water pipe, waterfall and big boulders there. Finally, we drive back to Kathmandu from Sundarijal.